Dimensions 0.25 by 4 by 7 in. If you have a Perl programming question, you'll find the answer quickly in this handy, easy-to-use quick reference. 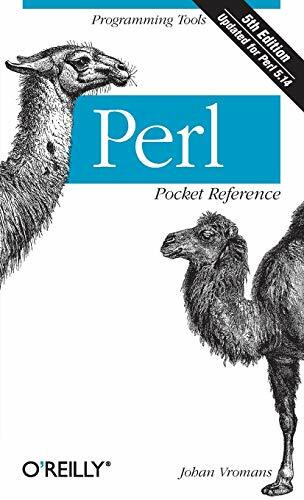 The Perl Pocket Reference condenses and organizes stacks of documentation down to the most essential facts, so you can find what you need in a heartbeat. Updated for Perl 5.14, the 5th edition provides a summary of Perl syntax rules and a complete list of operators, built-in functions, and other features. It's the perfect companion to O'Reilly's authoritative and in-depth Perl programming books, including Learning Perl, Programming Perl, and the Perl Cookbook..
About: If you have a Perl programming question, you'll find the answer quickly in this handy, easy-to-use quick reference. About: Compiles Perl documentation to provide basic Perl facts, including a summary of syntax rules and a list of operators and built-in functions.